An eye-catching creation with an adjustable chain so that it can be worn high of low. This beautiful combination of white jade and agate offers subtle variation in the white which in turn provides interest and depth to the design. Agates: All foster love, create an appreciation of nature; soothes emotions. White Agate: Relieves stress, gives protection, and increases courage. Jade: Is connected with love and virtue and is called the “fidelity stone” – it balances energies between self/partner and opposing energies in both the internal and external domain of one’s reality. It promotes peace and harmony, and soothes energy. Jade assists in finding wisdom for problem solving. Gold: (Filled/Plate) Brings vitality and solar energies into the body. It encourages optimism, courage, determination and an overall sense of well-being. It dispels fear and negative emotions. A stunning creation of garnet and gold plate – these garnets are exquisite A+ quality. The necklace is 46″ long which allows for great versatility as it can be doubled and worn as two medium length necklaces, one short and one long necklace, or one single long necklace. It is appropriate for both day and night wear, casual or dressy. Garnet: Energizes, revitalizes and balances energy. Inspires love and devotion. Enhances sexuality and is a “Stone of Health”. It clears negative energy and enhances personal power for success. A spectacular crystal creation representing a beautiful night sky that is not quite black, not quite blue, nor quite gray – but a combination of all three colors. This exquisite blue-black- gray is further enhanced with the brilliance of the silver and crystal spacers and rondels, and the elegant pave crystal pendant. 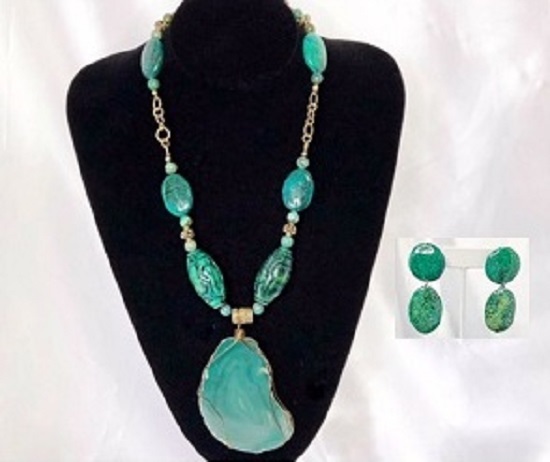 This is a “must have” set for the discerning woman! Crystals: (Swarovski/Czech) Attract positive energies, relieve and release stress. Crystals are said to improve your health and rejuvenate your body by stimulating the energy flow through your meridians. They ground you and connect you to Mother Earth, as well stimulate healing, personal growth and spiritual development. Silver: Is excellent for mental, emotional and physical releasing/cleansing. It works on the mind and emotions to see the overview of situations. It helps with emotional balance and patience. Like the moon’s energy, it has a gentle, cool, smoothing effect, thus reducing stress. Lily of Valley Egg Trinket Box, by Ciel Collectables. Hand Painted Enamel with Swarovski Crystal and Faux Pearl. Medium size is (3 1/2) inches tall. Add this gorgeous trinket box onto your order of any piece of jewelry, and we will package them together and ship them out to your loved one. Lily of Valley Egg Trinket Box, by Ciel Collectables. Hand Painted Enamel with Swarovski Crystal and Faux Pearl. Large size is 6 inches tall. Add this gorgeous trinket box onto your order of any piece of jewelry, and we will package them together and ship them out to your loved one. Be uplifted by the gorgeous color combination of this delightful creation. The pendant consists of 3 hearts made from cloisonné with a floral design. Cloisonne: (Pronounced cloy-zon-ay, French for ”partition”) is an ancient metalwork technique that makes use of small, precious metal filaments and colorful glass enamels to create brilliant artwork. The metal wires are bent into shapes to create small cells, (partitions) of designs. outfit and be appropriate for all occasions. rhythms allowing for a better balance of the body’s natural energy. well-being. It dispels fear and negative emotions. A stunning unusual creation! It’s bold and daring and requires very special women to be able to carry it off. Quartz: (Crystals) Empowers and protects by amplifying and focusing energy. It stores, releases and regulates energy and facilitates growth and awareness. It alleviates anger and opens the spirit for meditation and spiritual development. Crystals: Attract positive energies, relieve and release stress. Crystals are said to improve your health and rejuvenate your body by stimulating the energy flow through your meridians. They ground you and connect you to Mother Earth, as well stimulate healing, personal growth and spiritual development. A unique creation using a pale pink shell donut pendant wrapped in sterling silver, and coin fresh water pearls. The shell is a natural Bleufer Shell. In all its difference, it emits a soft, tranquil feeling. This is a delightful set. Pearl: (Fresh Water) This is the “Stone of Health” – it brings inner peace. It represents innocence and purity, and it enhances endurance and emotional stability. They can especially enhance personal integrity. It is said to benefit the lungs. Pearls come in a wide range of colors that each project their own messages. White pearls are said to promote good health and pink pearls bring happiness to the wearer. Shell: Seashells have the natural ability to disperse negative energy. Shell stimulates intuition, sensitivity, imagination and adaptability. It helps to enhance mental clarity and provides insight into decision-making. Silver: (Sterling) Is excellent for mental, emotional and physical releasing/cleansing. It works on the mind and emotions to see the overview of situations. It helps with emotional balance and patience. Like the moon’s energy, it has a gentle, cool, smoothing effect, thus reducing stress. BRIDE – A classic, elegant look with just a touch of “sparkle”. The large silver crystals spacers could stand alone – they are that lovely, but being surrounded by large fresh water pearls makes them a very special feature. MAID OF HONOR – A delightful combination of fresh water pearls and bicone crystals, complimented by a crystal heart. This creation will be worn and enjoyed for many years. BRIDESMAID – A charming necklace with a tiny silver plate heart to compliment the lovely bicone crystals and fresh water pearls. The long silver spacers add a light and airy feel to the design. FLOWER GIRL – A lovely simple design comprised of a silver plate chain interspersed with fresh water pearls and facetted crystals. The tiny heart in the middle of the necklace adds a very special touch to this delightful necklace. Pearl: (Fresh Water) This is the “Stone of Health” – it brings inner peace. It represents innocence and purity, and it enhances endurance and emotional stability. They can especially enhance personal integrity. It is said to benefit the lungs. White pearls are said to promote good health. Silver: (Plate) Is excellent for mental, emotional and physical releasing/cleansing. It works on the mind and emotions to see the overview of situations. It helps with emotional balance and patience. Like the moon’s energy, it has a gentle, cool, smoothing effect, thus reducing stress. Halloween is right around the corner and this fun and festive pumpkin necklace and earring set will be great for all of your Halloween jewelry needs. Our happy pumpkins are made of reconstituted dyed Howlite. Howlite: A “tranquility stone.” Calms communication, enhances emotional expression and eliminates stress, rage and rudeness. Assists with the attainment of goals by encouraging ambition and eliminating hesitation. A delightful, elegant but simple design complimenting the neckline of the wearer. This creation provides harmony in shape, size and elements. The beauty of Nature’s pearls and crystals enhanced by the simple clarity of Man’s ability, clear glass. This set could be worn on all occasions. Crystals: Attracts positive energies, relieves and releases stress. Crystals are said to improve your health and rejuvenate your body by stimulating the energy flow through your meridians. They ground you and connect you to Mother Earth, as well stimulating healing, personal growth and spiritual development. This collection has a quiet elegance throughout. It has a wonderful sophistication but will not detract from the person wearing it. This will be a ‘go to’ accessory. The earrings are spectacular! Pearl: (Fresh Water) This is the “Stone of Health” – it brings inner peace. It represents innocence and purity, and it enhances endurance and emotional stability. They can especially enhance personal integrity. It is said to benefit the lungs. Pearls come in a wide range of colors that each project their own messages. White pearls are said to promote good health. 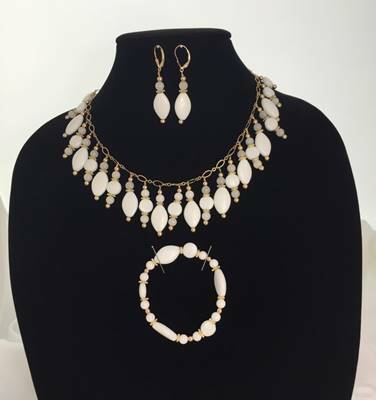 A very beautiful set of a necklace, earrings and a bracelet of fresh water pearls, Swarovski crystals and sterling silver. The necklace has a detachable eight inch back drop for the backless wedding or evening gown. Simple but stunning! The necklace, earrings or bracelet may be purchased individually. Pearl: (Fresh Water) This is the “Stone of Health” – it brings inner peace. It represents innocence and purity, and it enhances endurance and emotional stability. It is said to benefit the lungs. Crystals: (Swarovski) Attracts positive energies, relieves and releases stress. Crystals are said to improve your health and rejuvenate your body by stimulating the energy flow through your meridians. They ground you and connect you to Mother Earth, as well stimulating healing, personal growth and spiritual development. Silver: (Sterling/Plate) Is excellent for mental, emotional and physical releasing/cleansing. It works on the mind and emotions to see the overview of situations. It helps with emotional balance and patience. Like the moon’s energy, it has a gentle, cool, smoothing effect, thus reducing stress. This spectacular creation is truly fit for a queen! The Swarovski crystals add an amazing sparkle to this exquisite necklace and earrings. There is tremendous movement in the design. This is without doubt a ‘show stopper’ that any woman would be proud to wear. Crystals:(Swarovski) Attracts positive energies, relieves and releases stress. Crystals are said to improve your health and rejuvenate your body by stimulating the energy flow through your meridians. They ground you and connect you to Mother Earth, as well stimulating healing, personal growth and spiritual development. A necklace fit for young royalty. This beautiful pearl necklace is enhanced with a delicate Swarovski posies in the center. This necklace is the perfect enhancement for a night out where the wearer should be treaty like royalty and has a matching bracelet. This necklace also matches the Royal Duchess necklace for those special mother/daughter occasions. Pearl: This is the “Stone of Health” – it brings inner peace. It represents innocence and purity, and it enhances endurance and emotional stability. It is said to benefit the lungs. Crystals: (Swarovski) Attracts positive energies. Bold – Daring – and DAUNTLESS! This creation demands attention as it is a ‘statement piece’ that cannot be missed. This is for the woman who loves who she is and gets what she wants. Agates: Agates foster love, create an appreciation of nature and soothe emotions. Agate is an excellent stone for rebalancing and harmonizing body, mind and spirit. It cleanses and stabilizes the aura, eliminating and transforming negativity. It enhances mental function, improving concentration, perception and analytical abilities. It soothes and calms, healing inner anger or tension and creates a sense of security and safety. Agate is a stone of strength. It is also known as a good luck stone. Green Agate: Enhances forthrightness and decisiveness. It also enhances memory. Jasper: Is known as the “Supreme Nurturer”. Australian Mookaite Jasper: Encourages the desire for new experiences and helps to keep a balance between external activities and the internal response to these. It imparts a deep calm while encouraging versatility. Brass: energy is for protection and its yellow color resonates with our solar plexus chakra. Brass is made of copper and zinc. Zinc it is said to be good for the enhancement of overall life-forces as well as building confidence, strength, and courage; provides for the synthesis of personal power, physical energy, and creativity. Copper is known as “The Healing Metal”. It is also known as the lucky metal. 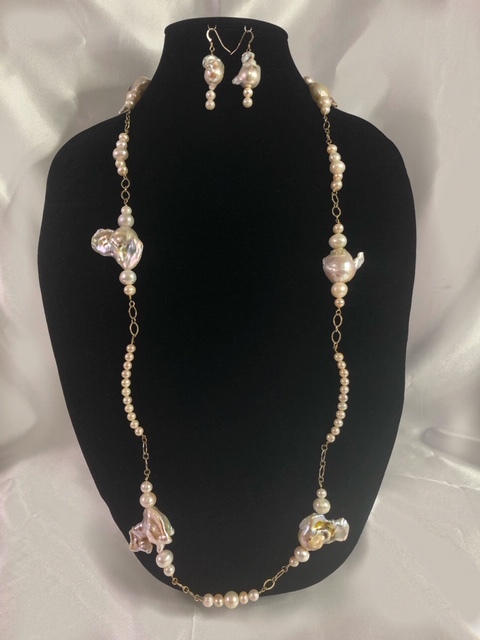 This elegant necklace offers the pure pleasure of enjoying and appreciating the different types of pears from Baroque Pearls, the natural colors of true Fresh Water Pearls, and the variation in shape and size of Fresh Water Pearls. Gold: (Filled) brings vitality and solar energies into the body. It encourages optimism, courage, determination and an overall sense of well-being. It dispels fear and negative emotions. A very special creation – an outstanding example of elegant sophistication! The chain has simple clean lines which emphasizes the beauty of the leopard.The pendant is completed with the addition of two black (color enhanced) pearls. “Waves of Happiness” is an exotic, eye-catching creation! Like the waves of the ocean, this creation has tremendous movement and a beauty all of its own. This is truly a spectacular set! Pearl: This is the “Stone of Health” – it brings inner peace. It represents innocence and purity, and it enhances endurance and emotional stability. They can especially enhance personal integrity. It is said to benefit the lungs. Pearls come in a wide range of colors that each project their own messages. White pearls are said to promote good health. Pewter: Thought to bring good fortune and money. Good for headaches and lung ailments.